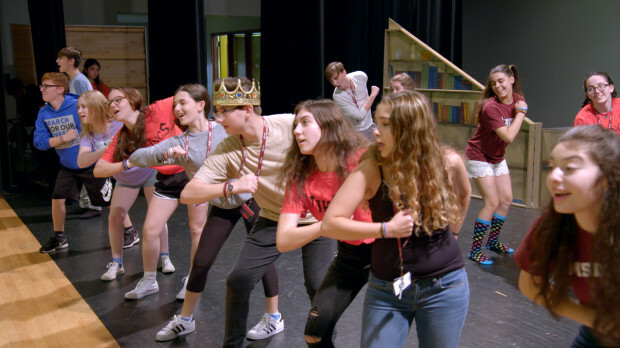 After the shooting at Marjory Stonemason Douglas High School in Parkland, Fla., that killed 17 students and staff members, drama teacher Melody Herzfeld still had to put on a musical. The results are found in the short documentary from Amy Schatz, “Song of Parkland” (HBO, 7 p.m.). Jeffrey Dean Morgan’s character John Winchester returns to “Supernatural” (CW, 8 p.m.) for the first time since season two, for an emotional reunion with Samantha Smith’s Mary as the show marks its 300th episode. The show was recently renewed for a 15th season, making it the longest running series on the channel. Abby drops off her laundry for the first time and loses her favorite sweatshirt on “Broad City” (Comedy Central, 10 p.m.). Earlier, an animal house party goes wrong on “Ex on the Beach” (MTV, 8 p.m.). “Celebrity Big Brother” (CBS, 9 p.m.) is already promoting its finale, which is next week. Life for the siblings get more complicated on “The Other Two” (Comedy Central, 10:30 p.m.) as their little brother gets more famous. The gang on “The Big Bang Theory” (CBS, 8 p.m.) imagines what Koothrappali’s canceled bachelor party could have been like, while “Young Sheldon” (CBS, 8:30 p.m.) squabbles with Dr. Sturgis. The Pontiac Bandit may be active again on “Brooklyn Nine-Nine” (NBC, 9 p.m.). On “Law & Order: Special Victims Unit” (NBC, 10 p.m.), Stone prosecutes the case of woman who killed her abusive husband. Honda reunites with an old flame on “S.W.A.T.” (CBS, 10 p.m.). A Greenwich Village town home is a challenge on “Backyard Envy” (Bravo, 10 p.m.). “Top Chef” (Bravo, 8 p.m.) competes for the University of Kansas basketball team. Competition continues on “The Titan Games” (NBC, 8 p.m.). “Million Dollar Listings Los Angeles” (Bravo, 9 p.m.) looks for wealthy buyers at the racetrack. Will’s department head dies just before he could give a recommendation on “Will & Grace” (NBC, 9:30 p.m.). On “Legacies” (CW, 9 p.m.), Lizzie is back from Europe. A handsome consultant arrives just before Delilah’s restaurant opening on “A Million Little Things” (ABC, 9 p.m.). Lil John celebrates So So Def’s 25th anniversary on “The Rap Game” (Lifetime, 10 p.m.). “The Dead Files” (Travel, 9 p.m.) investigates the abandoned New Mexico State Penitentiary. “Kindred Spirits” (Travel, 10 p.m.) goes to Gettysburg. Annalise and Nate want Gabriel to keep their secrets on “How to Get Away With Murder” (ABC, 10 p.m.). Turner Classic Movies starts with two movies for which Joseph L. Mankiewicz won both writing and directing Oscars, “All About Eve” (8 p.m.) and “A Letter to Three Wives” (10:30 p.m.), then a pair of swashbuckling nominees, “The Mark of Zorro” (12:30 a.m.) and “The Adventures of Robin Hood” (2:15 a.m.). Earlier in the day, prison movies with Oscar nominations include “Weary River” (6:15 a.m.), “The Big House” (8 a.m.), “The Criminal Code” (9:45 a.m.), “I Am a Fugitive from a Chain Gang” (11:30 a.m.), “Caged” (1:30 p.m.), “I Want to Live!” (3:15 p.m.) and “King Rat” (5:30 p.m.). NBA action includes Lakers at Boston (TNT, 8 p.m.) and San Antonio at Portland (TNT, 10:30 p.m.). Before both is the NBA All-Star Game draft (TNT, 7 p.m.). Men’s college basketball includes Central Connecticut at St. Francis (ESPNU, 5 p.m.), Houston at UCF (CBS Sports, 7 p.m.), Cincinnati at Memphis (ESPN2, 7 p.m.), Radford at Hampton (ESPNU, 7 p.m.), Penn State at Ohio State (ESPN, 7 p.m.), Iowa at Indiana (ESPN, 9 p.m.), South Florida at SMU (ESPNU, 9 p.m.), Washington at Arizona (ESPN2, 9 p.m.), Western Kentucky at Rice (CBS Sports, 9 p.m.), BYU at Portland (ESPN2, 11 p.m.) and Pacific at Saint Mary’s (ESPNU, 11 p.m.). Figure skating includes the Four Continents Championship women’s short program (NBC Sports, 5 p.m.) and the men’s short program (NBC Sports, 11:30 p.m.). Kelly Ripa and Ryan Seacrest: Kate Walsh, Donnie Wahlberg, Justin Chapple. The Talk: Taraji P. Henson. Ellen DeGeneres: Melissa McCarthy, Richard E. Grant. Wendy Williams: Brian Balthazar, Jason Biggs. The Real: Christina Moses, Romany Malco. Stephen Colbert: Chris Pratt, Meghan McCain, Beirut. Jimmy Kimmel: Jennifer Connelly, Richard E. Grant, Why Don’t We, Miley Cyrus & Mark Ronson. Jimmy Fallon: Kim Kardashian, James Cameron, Christina Tosi. Seth Meyers: J.J. Watt, Tim Meadows, Anna Konkle, Maya Erskine, Tucker Rule. James Corden: Matt LeBlanc, Will Arnett, Broods. Carson Daly: Flula Borg, Alex Simmons, Julien Baker, Aldis Hodge. Trevor Noah: Dorothy Butler Gilliam. Conan O’Brien: Nick Kroll.